Gränd Salon wanted to update their existing brand to represent the hair salon’s large new space with added spa services. To better reflect their new studio with ample natural light and custom-designed stations of wood and steel, we designed business cards with graphics laser-etched into real wood. To cleverly and cost-effectively promote their new mani-pedi services, we created an emory board with the new address with the message “Look Grand from head to toe.” Their new salon launched successfully with these materials and a fresh website in place. 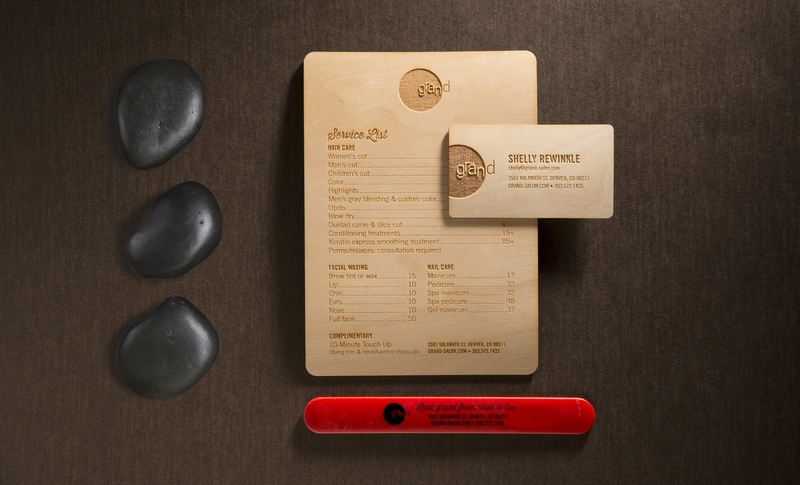 Their stylish clients coveted the new wooden business cards. This project received an Applause award from Art Directors Club of Denver.